Niagara Grandview Manor is a distinctly prominent property that overlooks the Niagara River and Gorge and has been welcoming guests since 1961. 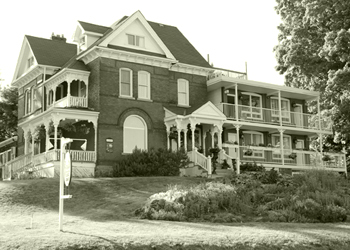 Our historic Inn, built originally in 1891, sits majestically atop a hill and is just 5 - 10 minutes walking distance to the Falls, Major Attractions, Casinos, WEGO transportation stops and Queen Victoria Park. There is nothing like sitting on one of the balconies enjoying the view and the comforting breeze provided by the rapidly moving water of the mighty Niagara River. The natural rock gardens of Niagara Grandview Manor win the accolades of passers-by . The massive and verdant grounds provide the perfect setting for relaxation with a book or one of Niagara's exceptional wine. Located directly adjacent to our main building, this four bedroom home sleeps a total of 8 persons (4 queen beds) and offers warm décor and provides a welcoming feel to your group or extended family gatherings. 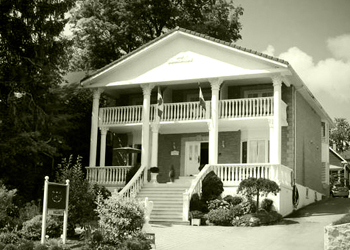 Eastwood Tourist Lodge is located just off river road and directly adjacent to our sister property, Niagara Grandview Manor. 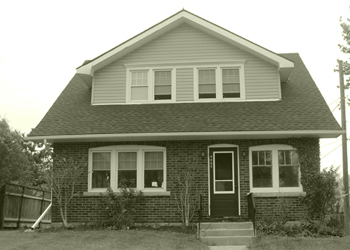 Our historic home, built in 1925, is just 5 - 10 minutes walking distance to the Falls, Major Attractions, Casinos, WEGO transportation stops and Queen Victoria Park. Eastwood Tourist Lodge is typical of the Arts and Craft style homes of the period with large oak baseboards, wide window and door moldings, leaded glass windows, and electric fireplace. The home comfortably sleeps 8 persons in a total of 4 bedrooms and is service by one second floor bathroom. Breakfast is a wonderful time of day and is served in our adjacent property Niagara Grandview Manor where guests can select to have their breakfast in either the formal dining area, adjacent verandah, or garden level patio. A full complimentary cooked to order breakfast is served and includes lots of homemade ingredients made especially for our guests. 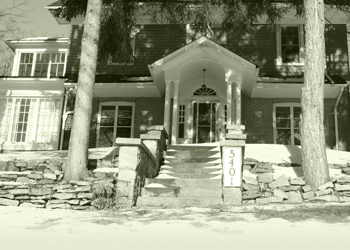 Located just 4 doors away from our main building, Niagara Grandview Manor, this deluxe villa built in 1912 sits high atop the ridge overlooking the Niagara Gorge. Recently renovated, this deluxe villa is bright throughout and offers guests front and rear patios and two sunrooms. This home is typical of the Arts and Craft style homes of the period with large oak baseboards, natural oak window and door moldings, leaded glass windows, interior arches, front porch vestibule. The home comfortably sleeps 8 persons in a total of 4 bedrooms (1 King Bed, 1 Queen Bed, 1 Double Bed and finally a room with 1 Double Bed and 1 Single Bed) and is service by a two second floor bathrooms and a 3 piece bathroom with shower on the main floor. The home is centrally heated and central air-conditioned. This beautiful large Mediterranean style villa inspired by classical Graeco Roman architecture is directly adjacent to Niagara Gorgeview Inn and only 3 doors down from the main Niagara Grandview Manor hub. This 7 bedroom, 7 bath two storey home rents out individual rooms to travelers but can also be rented as an entire house for large families and groups. This home can sleep a maximum of 16 persons and features 3 fireplaces. The home features central heat and air-conditioning, travertine and hardwood floors, complimentary wifi, and finally the breakfast offerings of Chef Joseph Hughes. Enjoy stunning views of the Niagara Gorge while relaxing on the balconies. Email: reservations@niagarahistoricinns.com | Call 1-289-296-3301 for reservations.